SLBU are of the absorption silencer type. 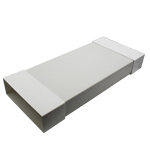 The straight types consist of an outer and inner sheet casing. A 100mm Baffle is fitted for further noise reduction. The connections of the circular types are supplied with a Safe-gasket.